I have never cared for diamonds. I prefer stones that have rich, deep color like my birthstone, amethyst. Jewelry can be beautiful but i think a lot of folks take owning expensive, gaudy jewelry as a sign of wealth too seriously. However, after reading about how real diamonds can be created in a lab, even using the ashes of a loved one, my interest piqued. You see, what remains of my son is in a memorial box in my closet. He would make a beautiful diamond! The other thing that I appreciate about these helped-by-scientific-technology gems is that they are not blood diamonds. They are genuine stones that do not rely on the labor of exploited miners for production. I agree that to wear a diamond anymore makes you feel tainted with human blood, and I, too, prefer wearing my two favorite stones - sapphires (my daughter's birthstone), and amethyst (mine). Thanks for keeping this subject in the news, Cate. This is so interesting. What they can do nowadays. Thanks for another great story Cate. Fascinating Cate Thank you. The large diamond companies...MOSTLY DeBeers are probably really freaking out over the huge losses that will happen once this really hits main stream and the general public embrace it. This could be a very dangerous situation for the new up and coming providers. 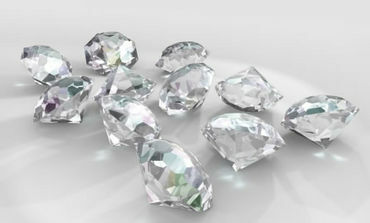 It is good that they can now grow diamonds for those that want them. I prefer the stones as they come out the ground before they have been fiddled with. Have you ever taken a scoop of sand and put it under a microscope? It is more beautiful than any jeweler's window. Please try it and see for yourself what a beautiful world we share. This will be interesting to see how the diamond industry handles this entering the market. They didn't call the traditional ones "blood diamonds" for nothing. I could never buy a diamond, again...and I lost my last one..lol, because you just can never know where it came from..., but this story Cate, would be a great alternative, and maybe help with the horror in the diamond trade. Thank you. I'm not into diamonds myself (my favorites are amethyst & blue topaz), but I have heard of having your loved ones ashes being made into a gem. I might contemplate doing this when my doggies go over the Rainbow Bridge (if I can afford it).